In 1971, Bob Eberle released a book called SCAMPER: Games for Imagination Development. The creative technique he described there has since been of huge value to people called on to generate ideas. In this episode, James Schramko breaks down the SCAMPER technique and how you can apply it as an entrepreneur. 02:20 – What can you replace? 06:29 – What else is it good for? 07:21 – Is there something you can remove? James Schramko here, and welcome back to SuperFastBusiness.com. And today, I would like to share with you the concept of the SCAMPER technique. Using SCAMPER, you can come up with fantastic business ideas with a very simple process. I used the SCAMPER technique early on in my online career to come up with an incredibly creative bonus that helped me sell website software, and it gave me an advantage. I was able to come to the market and fairly quickly dominate using the SCAMPER technique. So what is the SCAMPER technique? It’s actually an acronym, representing seven ways that you can consider an existing object in order to come up with something new. In other words, it’s a creativity technique. S stands for substitute, C for combine, A for adapt, M for modify or magnify, P to put to another use, E to eliminate, and R to reverse. We’re going to explore each one of these in more detail. As an entrepreneur, you’ll often find the requirement to come up with ideas, whether it’s for an existing product that gets stale, whether you want to add a new service to your business, or if you’re just looking for innovation. And innovation is one of the two things that you need for business success, according to Peter Drucker. He was very keen on innovation and marketing. So in such cases, it’s really good to have a framework to go by to make your brainstorming so much more productive, and overcome some of the sticking points that would hinder you getting ahead. 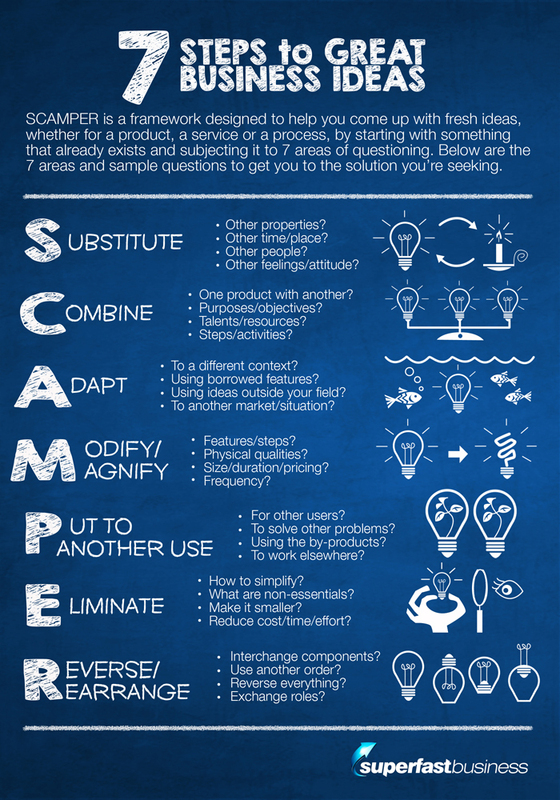 To apply SCAMPER, you simply take your product or service or process that already exists and you use that as a starting point. And by yourself or with the collaboration of others, you ask questions about your starting object based on the seven areas indicated in the acronym. So let’s break these down into more detail. S for substitute – what can you take away from the object and replace with something else? Might be a physical property, a step in the process, or someone involved, an attitude towards the object. Some simple questions could be, can you use other materials or ingredients? Can you make it look, smell or feel differently? Can the time or the place be replaced? Can someone else do the task? Can it be sold someplace else or to a different consumer? I mean the classic example here is Vegemite, which is a yucky black spread that people put on their toast in Australia. It came from the English Marmite and it’s actually the by-product of the brewing process to make beer. But they said, hey, this gooey stuff that we use to make beer, we’re left over with, why don’t we just stick it on toast? Hey, it’s a great source of vitamin B. Can part of the process be substituted to improve the outcome? Or could a change of attitude or feelings toward a product improve sales? Here’s another example – by offering a product, say a laptop, in different colors, you can appeal to different customer tastes. Remember those iMacs from Apple? They’re all different colors, like that tangerine orange, there was a green one and blue one. They appeal to different buyers. C is for combine. Combining two objects can result in something fresh and exciting that functions better than either object on its own. Consider taking your base product, service or process and merging it with some other element that will improve the original. Some things you can ask are: would combining this product with something else increase its value? What purposes or objectives can be combined? Can talents and resources be combined for better results? Can two steps of a process be combined? Will combining activities make them more effective or save resources? Here’s an example: bundling several info products with a subscription membership and some coaching could result in a fantastic business that you can charge a higher rate for. That’s actually simpler to understand for customers and it gets them a better result in much the same way as SuperFastBusiness Membership is the combination of multiple elements that come together to create a fantastic offering to help business owners become more profitable. If you want to find out more about that, check out the home page at SuperFastBusiness.com and take a short quiz so that we can see how I can help you the most. A for adapt. Consider adapting or adjusting your product to serve a different purpose. Look to similar solutions for ideas you can borrow and incorporate. So some questions you might ask: What else is like this in the market? Is it similar to something in a different context? What features can you copy from other sources? Are there ideas outside your field that you can use to enhance your product, service or process? Is there another market situation that you could adapt the object to? For example, if your e-commerce site is not already mobile-friendly, adapting it for mobile viewing will greatly extend the reach of your business. Modify or magnify. Changing some quality of an object or magnifying parts of it can enhance its perceived value or improve its function. Here are some things to consider: can you change a feature or step of a product or process to improve it? Will adjusting the physical qualities of an object enhance its value? What aspects of the object can be highlighted or emphasized? Can you increase the size, duration or pricing of an object? Can frequency be increased? Here’s an example – by making a service subscription based, you can increase the frequency of payment and make your business far more sustainable with predictable cash flow. Put to another use. An existing product or process may have other possible applications for which you are not currently using it. Consider what those might be and whether you can use your object for those purposes to the advantage of your business or of other people. Think about this: Who else can benefit from your product? Can people outside your target market use it? Are there other problems your product or process can solve? Would it work as well somewhere else? Does it create by-products that can be made useful? Could it be modified to suit another purpose? Here’s an example: When asked to be a guest on someone else’s podcast, you might record your half of the conversation, have it summarized into bullet points and then you use that as material for your own podcast. Eliminate. Streamlining a product or process by removing excess elements can improve function, increase efficiency and result in more elegant solutions. Ask these questions: how can this be simplified? What parts are non-essential to its function? What features can be de-emphasized or removed altogether? Can it be made smaller? Should it be split into different parts? How can you reduce the cost, the time or the effort? Here’s an example: Apple products are admired for the pared-down simplicity of their design. Take for instance the one-button iPad or the buttonless mouse. Rearrange or reverse. What if part of the product or process was reversed, done in another order or made in a different orientation? Dare to consider things upside-down, backwards or inside-out, just different from what you’re accustomed to. Here are some questions you could ask: can components be interchanged? Can patterns or layouts be switched? What other order can you use? What if everything was reversed? Can schedules be modified? Would another arrangement be better? Can people exchange roles? How can you achieve the opposite effect of something? I really liked that one. Quite often I’ve asked, “What would I do if I wanted the opposite effect?” and sometimes an answer is revealed. Example: Uber has turned the way people get a taxi ride on its head. Instead of searching for a taxi, they simply have the ride come to them. Now when I was using SCAMPER technique, it’s really important to do one thing in particular. Aim for quantity of ideas first over quality. Just let them flow. Put a timer and write down as many ideas as you can and then the second step would be to analyze the results afterwards. Don’t have any thought to it as you’re coming up with the ideas. Just stream out the ideas as fast as you can and get as many as you can. The key to design is to have a lot of ideas to choose from to start with and almost never is the very most obvious first idea the best idea. It almost never happens. Further develop those ideas that seem practical or feasible and start your prototyping, and go with low-resolution prototypes. So I hope you’ve enjoyed this episode about SCAMPER. You’ve been listening to SuperFastBusiness.com. I’m James Schramko. If you’ve enjoyed this, have a look at some of the other podcasts we have. If you’re not already a member, consider applying to SuperFastBusiness Membership, where I would love to coach you and help you grow your business. Please comment below the episode and let me know, how have you used SCAMPER to accelerate your business?